1. Beat the eggs and season. Heat 1 tbsp groundnut oil in a smal pan and add the eggs. Cook until just set. Slide onto a plate, roll up and slice. 2. Heat 2 tbsp groundnut oil in a wok and stir-fry the spring onions, grated ginger, red chillies and garlic for 1-2 minutes. 3. Add boiled rice and 4 tbsp water and stir-fry for 3-4 minutes until hot. Stir in the prawns, the egg and 4 tbsp soy sauce. 4. Sprinkle with the chopped salted peanuts. 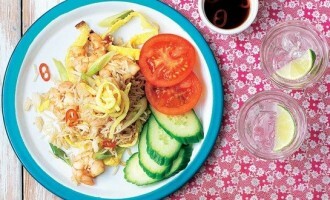 Serve with cucumber, tomato and soy sauce.